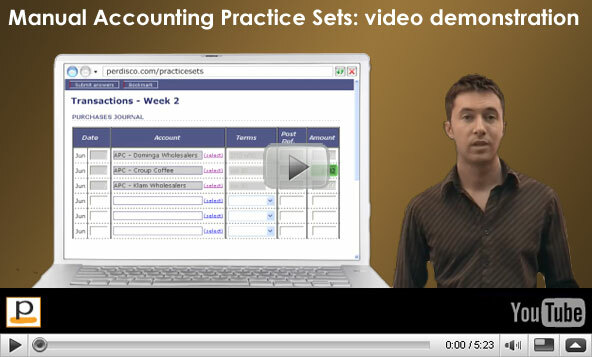 An accounting practice set is the best way for students to learn the practical skills essential to accounting, through the completion of a one month accounting cycle for a fictional business. are too time consuming to grade and provide feedback on. We have listened to your feedback and suggestions to create a range of practice sets that solve these issues and establish a new standard for other publishers. What are we doing differently to other publishers? FREE practice sets: Our free practice sets have no restrictions or fine print and are genuinely available for all undergraduate college and university courses in Australia. Other publishers' practice sets can cost up to $50 per student, so adopting a Perdisco practice set can save a course literally thousands of dollars. No other practice set is able to offer instructors and their students the same features we do. If you are an instructor, please contact us now to find out more or to order a review copy and receive access to an interactive demonstration. Instructors: Do you teach MYOB? If your accounting course teaches students how to use the MYOB accounting software package instead of manual accounting, please check our MYOB practice sets for more information.